At Sharing Housing, we’ve heard from participants in workshops, webinars, and in casual conversation that having a home-mate who doesn’t appreciate a healthy lifestyle, specifically when it comes to food, is a deal breaker. If you are as susceptible as I am to sweets, it’s probably not best to have a home-mate who rather eat rich, sugary treats rather than nutritious fruits and vegetables. 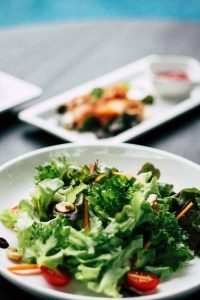 And as I’ve discovered over the years, as much as you’d like to share your love of healthy recipes and meals, people take their choices of what to eat personally and can get hostile if you make suggestions of how to make a meal healthier. Saying “turkey is a leaner choice instead of bologna, why not try that next time?” is probably not going to land very well. As adults, especially ones who share a home, we can easily shrug off some food foibles especially when you both share the same philosophy concerning food. If, however, what enters your future kitchen is a concern, we recommend–as we’ve often advocated on this blog–to have a heart-to-heart conversation with your potential home-mate and discuss the expectations of keeping a healthy and nutritious kitchen. Yoou might find a potential home-mate who really wants to make changes in their life and that might start with diet. Be an inspiration. During your initial conversation ask them what they’re looking for in a home-mate. You might be surprised to hear they really want someone who will inspire them to make better choices in their diet. If the relationship moves forward, offer to go grocery shopping together and point out where healthy choices can be made. Or better yet, dine together on Meatless Mondays and share recipes that will encourage her to maintain this healthier lifestyle change. I learned, painfully, that home-mates can get offended and angry when when you tell them that eating farm-factory raised meat is not so good. Don’t preach, don’t cite statistics, and don’t show gut-wrenching images to sway them from not eating a veal cutlet. By preaching the evils of eating conveyor belt meat, you will antagonize your home-mate, make her feel self-conscious, and the bond you wanted to create over sharing a meal will be broken. Instead, keep quiet, and show by example. Cooking food that is healthy and nutritious and sharing it will have greater success than critiquing her choices. One day, you might hear your home-mate tell you that she admires how you’ve helped her change her habits and achieve a level of better health. Listen to closely to her comments about how a certain meal didn’t sit well (“I paid the price with that late night dessert. I was up all last night.”) and share an experience (“I stopped eating after 8 pm and noticed I felt a lot better” or “When I reduced my sugar consumption I noticed I wasn’t having anymore brain fog moments”). Finally, remember talk and listen. As important it is to have a healthy kitchen, communication is key to a healthy and lasting home-mate relationship.